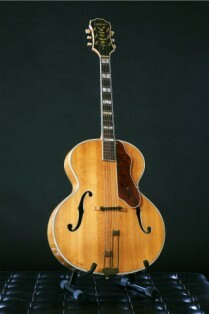 Acoustic American jazz guitars out of the Golden Era – preserved in the Netherlands. 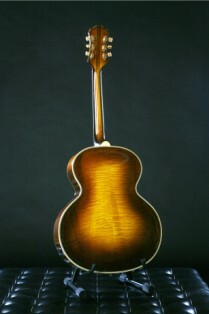 The necks in the early 1930s tended to be rather flat and wide and from the mid-1930s through the 1940s had a definite V-profile. 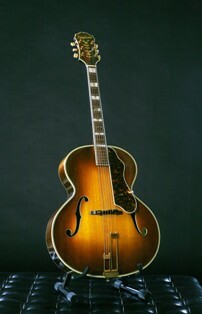 The 1950s necks retained this profile, though they were slightly fuller and the V a bit less pronounced. 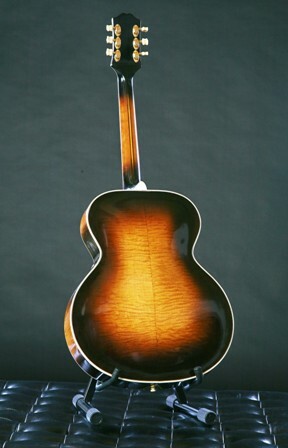 Smaller bodied guitars had slightly thinner, narrower necks. 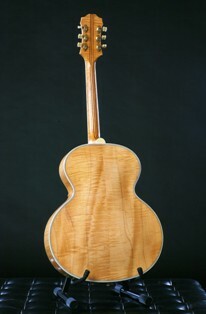 The necks joined the bodies at the fourteenth fret and were attached by a dovetail joint. 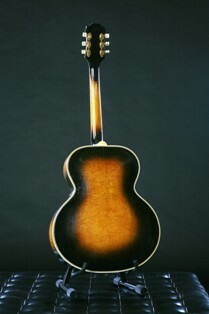 1932-1935 archtops mostly have rather wide necks, around 1 3/4” at nut, including small bodies like my 13+” Zeniths and Olympic. 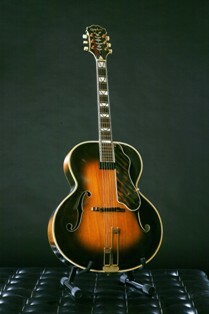 However they vary considerably in neck profile/depth and fingerboard radius. 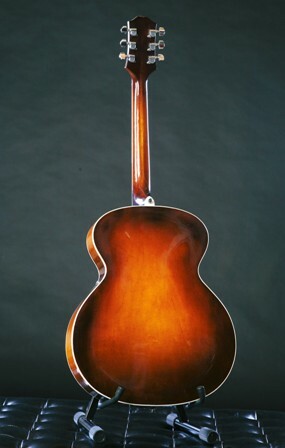 Around late 1935 the necks become very narrow -1 5/8” or some even 1 9/16” at nut, advertised in the catalog as “New Solo Neck” (Emperor, De Luxe) or “New Narrower Neck” (Triumph). 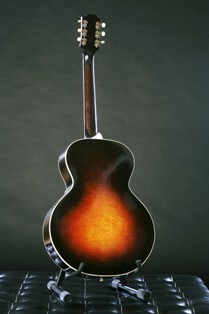 Around 1939-40 the necks seem to get a bit wider again and standardized at 1 11/16” wide at nut. 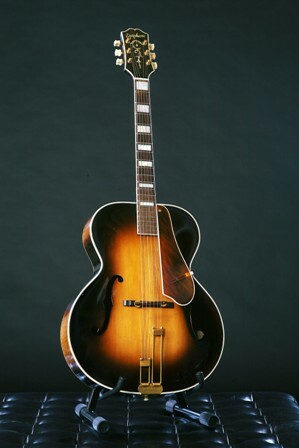 By 1934 a ‘patented expansion truss’ was a standard catalog description in upperline Epiphone necks. 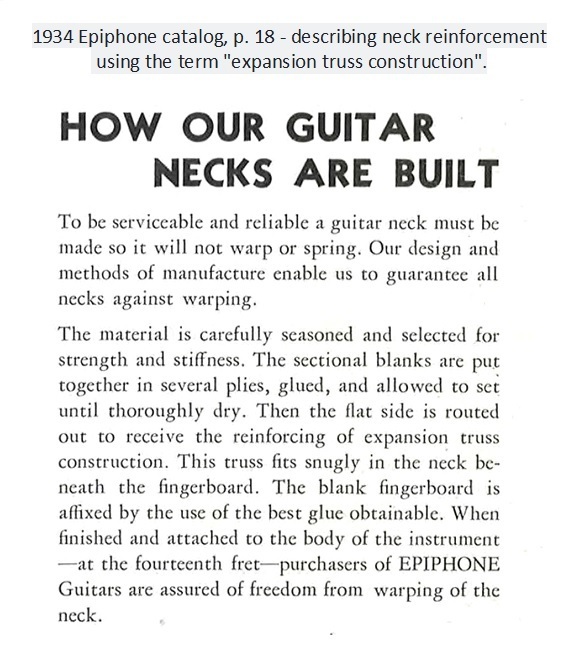 Lowerline instrument necks were simply ‘reinforced’. A patent application for an adjustable neck reinforcing rod was filed by Epi Stathopoulo on August 2, 1937 and was granted on February 28, 1939. 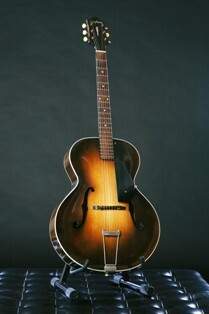 By 1939 it was referred to as the ‘exclusive and patented Epiphone thrust rod’ and was standard on all archtops. 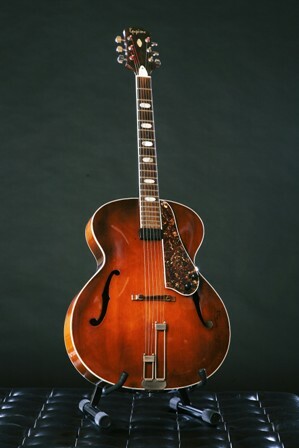 This feature was also referred to as ‘Epiphone adjustable cantilever brace’ in the description of the De Luxe model in that catalog. This rod ran the length of the neck and was threaded in to steel anchors underneath the first and twelfth frets. 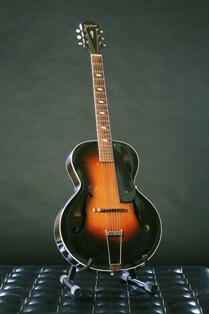 The rod continued from the twelfth fret under the fingerboard and came through the fretboard extension, between the extension and the top of the guitar. A female hex nut was welded to the end of the rod. 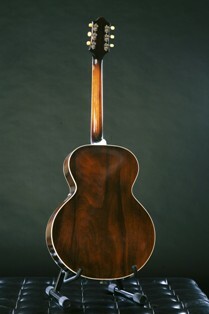 It was not visible from the top but could be seen from the side of the guitar. The rod was encircled in a tube of impregnated fiber which ‘prevents the freezing’ of the wood against the rod and facilitates the rotation of the rod when being adjusted. By 1952 the adjustment nut was moved to the peghead and was hidden under a small plastic cover plate.